The correct name for Amaryllis is in fact Hippeastrum, they are quite often mistakenly sold as Amaryllis, but should not to be confused with the one true (garden) Amaryllis Bella Donna. 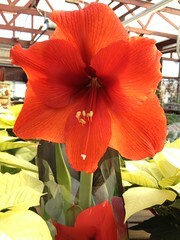 Hippeastrum is less hardy and mostly used for indoor growing. After planting allow 8-10 weeks for the plant to get into full blossom. How to plant and care for them? Plant the bulbs in 6-7 inch planters, depending up on the bulb size. Use a well-draining compost to partly fill the pot, position your bulb, and then fill it with compost. Plant them such that 2/3 of the bulb is exposed above the Soil and 1/3 is buried below. Keep the bulb warm at room temperature and water sparingly just once a week until the bud is visible above the bulb then increase watering. The flower heads are often so large that the stems cannot support them, stake the stem with a Bamboo rod for security. After flowering it will continue to grow foliage, so keep it warm and let it grow as a houseplant. Keep on watering and feeding with a liquid fertilizer throughout the summer. Allow the stem to turn brown and the leaves die back of their own accord, the bulb will use the nutrients in the stem. During fall gradually stop watering and allow the bulb to dry out as it needs a resting period. Keep it warm and it will start its cycle all over again in time for Christmas. 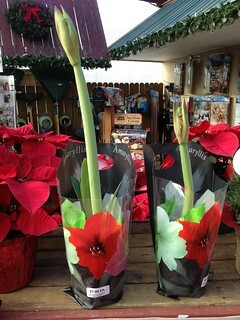 Hippeastrum are the ideal choice for that unforgettable Gift or simply just to treat yourself!